Bev Hoffman walked into the terminal banging a drum. “I’m the pep band!” she yelled out, laughing. Hoffman, a former musher and close friend of Kaiser’s family, organized a hero’s welcome. It’s a half-hour before Kaiser lands, and cars already line the highway. Fire trucks wait outside. Inside, people are filling the small Alaska Airlines terminal. “[It’s the] first time anybody won, and it’s Pete! Our Pete!” said his honorary grandmother, Lucy Crow, with tears in her eyes. Hoffman keeps time by banging a drum with the image of a wolf’s face on it. She says that the drum has been banned from basketball games for being too loud. There’s a lot of love in the room for Kaiser. 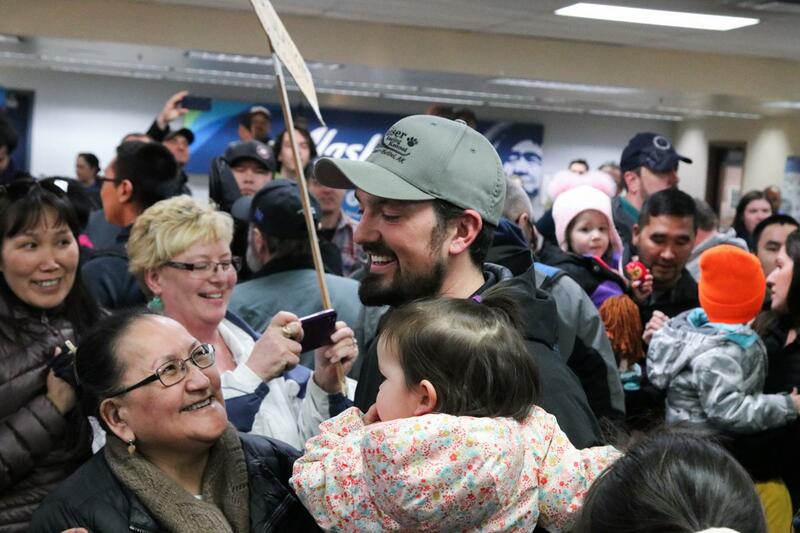 The town has supported him from when he was racing in local fun runs as a kid, to winning the Kuskokwim 300 four times, to now taking first in mushing’s most illustrious race. One woman says that she had a “Pete Kaiser hangover” from staying up watching the tracker the night he won. Then the terminal door swings open, and the expectant crowd lets out a giant groan. The first person out isn’t the person everyone is waiting for. One by one, other passengers emerge. A man announces that Kaiser is in row 22 near the back. But the crowd is ready to celebrate; everyone who walks out gets a cheer. Kaiser enters, holding his daughter. He looks stunned. He seems slightly overwhelmed, but happy, smiling. He begins shaking hands and sharing high-fives. Kaiser tries to avoid the spotlight, but Hoffman orders him to step onto the luggage conveyor belt and talk before it starts moving. After hugging and greeting people, Kaiser grabs his bags and is out the door with his family. Fans follow, ready for a caravan, but they have to wait. First the champion has to jump-start his truck. The Iditarod champion rolls out, escorted by two fire trucks, lights flashing and sirens wailing. Behind him streams a parade of cars. Fans line the highway, cheering and waving signs, welcoming their own Pete Kaiser home. Bethel Mayor Fred Watson is sponsoring a proposal to declare March 13, the date of Kaiser’s win, a city holiday.